I am this point in the heart, and there is nothing in me except that. I long to exit from this point towards others, towards spirituality, towards the group, but I am not capable of externally escaping myself with my own strength since the point can only maintain itself and nothing more than that. This is what I need. And below this point is my ego. In the meantime, it is small and physical, at the level of the animate. In order for me to have this tendency towards the group, this point is absolutely not enough. I need an environment that influences me in addition to my point in the heart, and then I will receive the force to bond to the group. So, then in some way, I succeed to be included in the correct environment (1). The environment begins to influence me with the importance of bestowal, the goal of spirituality (2). And this gives me the strength to begin to be included, just a bit, into the group (3). 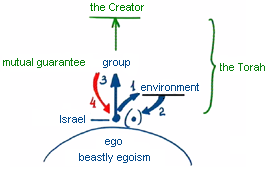 But when I try to be included in the group, I feel an unpleasant response: criticism, evil, rejection, and hate (4). And thus I constantly work: 1-2-3-4, and again 1-2-3-4….. When I feel this hatred, I again return to the friends and ask them to influence me so that the strength to overcome myself and connect to the group will appear for me in spite of the rejection. This is how we constantly work, in parallel to studying and dissemination work. And when all the forces and these tensions accumulate, we feel that we are in need of help, as is said, “Man will help his friends.” These forces of the environment that take care of me are already not enough for me. I need greater support from the other people. It is already not enough that the environment will supply the awakening for me. I need a real force that will allow me to be included into the group itself. I won’t have strength like this, if I don’t receive it from the others.